How to use a Kubotan for self defense? November 7, 2015 / Kubotan / Comments Off on How to use a Kubotan for self defense? Kubotan is a very versatile tool for its shape and solidness. It can be used creatively in many daily life tasks and not just as an effective self defense tool. The solid material of the kubaton, makes it also usable in many critical situations for example to break glass or to hammer something. However the most important use for a Kubotan that concerns us here is in self defense so let’s go through this. 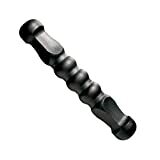 The kubotan grip will determine the type of applications and defenses you will be usining agains your attacker. It’s important to train different grips because you never know what circumstances you will be in, during an attack. Ice pick grip: This is actually my personal favorite for the versatility of the applications. Hammer grip: The kubotan is held as it you are holding a hammer. Center point grip: This is where you hold the kubotan in the middle of you hand so its both ends can be seen. This is the best grip for fist loading techniques. In this video, famous self defense instructor Peter Weckauf is showing different grips and applications that can be used with the pocket stick or the kubotan. The video is also showing the verstatility of the tools that can be used in the same way as the kubotan if you don’t have one. Compliance and restrain tool: you can use it to restrain and control your attacker, a lot of a fancy techniques are available for this application. Striking tool: you can jab and stab with the kubotan in different hand grips. Anchoring or locking tool: also a sort of control for your attacker may be to calm him down or until you can escape or you get some help. 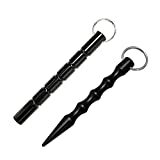 Fist loading tool: just punch with the kubotan in your fist, it will add a lot of power to your punches. The Kubotan is usually used by security gaurds or police enforcements for trapping, joint locking, blocking and extracting people. There are also tons of martial arts techniques where the Kubotan can be used artfully and elegantly, but when it comes to self protection or defense situation we need to only care about using it as effective and as quickly as possible to end or control the current situation. Another use of the kubotan is flailing the keys, I am personally not a big fan of this technique and don’t find it useful but still this is one more thing you can do with the kubotan keyring if you see the use for it. eyes, temple, throat, skull, solar plexus, collar bone, groin, spine, joints in general. Although there are body targets in which applying the technique against will be most effective, but hitting with the kubotan will be painful to any body part, so it’s not an exact science. The main principle is to be able to use the Kubotan to punish your attacker as much as needed to stop his attack and nothing more than that, or you will have to answer for that. So, the basic idea is to master fundamental effective combatives using the Kubotan because those will come naturally to you in a tough situation. After mastering the basic grips and strikes you can then get more advanced kubotan techniques in your arsenal to handle different types of attacks. Below are some selected videos that elaborate on this concept of using the Kubotan in a very basic but effective way in a street fight. Your practice need to be simple enough that you can apply it in any situation and it has to always start by practicing Kubotan drawing techniques as fast and smooth as possible. Mastering all the techniques in the world is not going to help you if you can’t draw your weapon at the right time when you need to. So start here. I included this video because this is how I think the kubotan should be used in most cases. You need to learn how to draw your kubotan and then use it for what it is good for. No need for fancy moves unless you are willing to put in great deal of time mastering techniques that you might not have the time to apply in a real fight. Joe’s vidoes about yawara stick are always good to watch. This video elaborate on the same concept of using the kubotan instinctively against your attacker’s body. The most fundamental part is to take the attacker’s mind off you as soon as possible and according to how threatinging the sitution is. Another cool video from raw combat, that elaborates on the same concept of reality based use of the kubotan or pocket stick. Most street attacks are violent and you will have to learn to use your weapon combatively to finish at attack by applying the needed force. Is a Kubotan effective in a street fight?